Richard Wagner Festival Hall, Bayreuth. 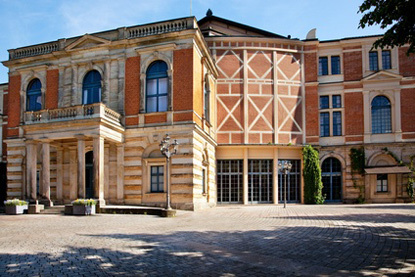 Everything in Bayreuth revolves around its famous annual festival founded by Richard Wagner in 1876 as a dedicated venue for his operas, an event still well alive today. The city had been a cultural capital since Princess Wilhelmine of Prussia, Frederick the Great's sister, invited architects and artists from all over Europe and founded the Margravial Opera House.